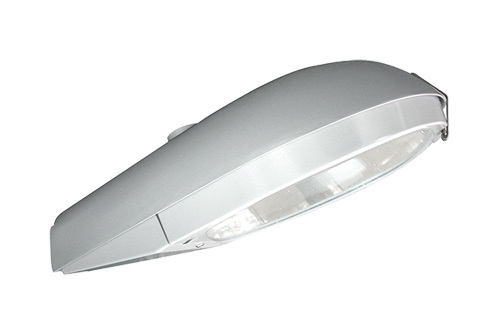 Area lighting, heavy duty die-cast aluminum housing, segmented aluminum designed reflector for the best light efficiency. For car lots, street lighting and parking areas. - Die-cast aluminum housing with stainless steel latch, gray polyester power coat finish. - Fully sealed with silicone gasket for prevent any leakage from the outside. - Heat and impact resistant tempered flat glass lens or borosilicate drop glass lens. - Optional dusk to dawn with twist-lock photocell. - Removable door assembly, Easy maintenance door latch system. Air craft cable for extra safety system. - Slipfitter mounting, compatible with 1.25” pipe (42.16mm O.D.) to 2” pipe(60.33mm O.D.). - Induction lamps have 100W rectangular lamp and 120W Olive Shape lamp. - Long lamp life rated 100,000 hours, nominal 82Lm/W, 80+ CRI.